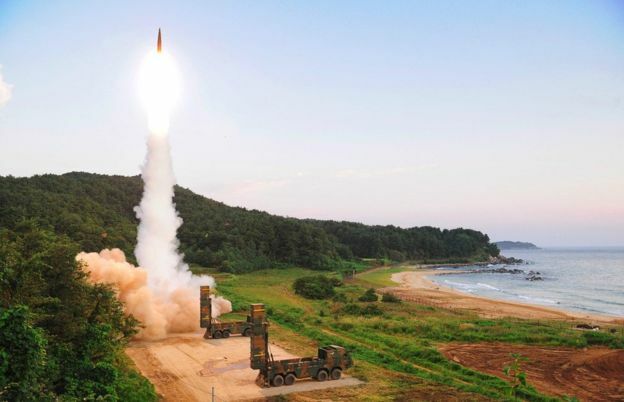 South Korea’s missile system firing Hyunmu-2 missile into the East Sea from an undisclosed location on September 4 during a live-fire exercise simulating an attack on North Korea’s nuclear site. AFP/Getty Images photo. SEOUL. South Korea says it has seen indications that the North is preparing more missile launches possibly an intercontinental ballistic missile. It said it was strengthening its controversial US-made Thaad missile defence system after the North’s test of a nuclear bomb at the weekend. The South has carried out live-fire exercises in response to the test. The US has warned that any threat to itself or its allies will be met with a “massive military response”. The North says it tested a hydrogen bomb that can fit on to a long-range missile. Pyongyang has repeatedly defied UN sanctions and international pressure by developing nuclear weapons and testing missiles, and the provocations have only intensified. In the past two months it has conducted intercontinental ballistic missile tests, sending one over mainland Japan into the Pacific Ocean. It has also threatened to fire missiles towards the US Pacific territory of Guam. The United Nations Security Council is to hold an emergency meeting later on Monday to discuss its response. Ahead of that meeting, South Korea and Japan’s leaders had agreed to push for a stronger UN resolution on North Korea, said a South Korean presidential palace spokesman. The Security Council last imposed sanctions in August, targeting North Korean exports. What has the South said? No timeframe was given for any launches but this Saturday, the anniversary of the foundation of the North’s regime, or October 10, the establishment of the ruling Workers’ Party of Korea, were possible dates. The ministry also told parliament the US would seek to deploy a nuclear-powered aircraft carrier to seas off the peninsula. It said it would temporarily deploy four more launchers of the US Thaad (Terminal High-Altitude Area Defence) missile defence system to join the two already at the site in Seongju, south of Seoul. Both China and Russia are strongly opposed to the Thaad deployment. The South’s Defence Minister Song Young-moo said it was now presumed the North had reduced its nuclear warhead in size to below 500kg (1,100lbs), and would be able to fit one on an ICBM. However, analysts have said the North’s claims about miniaturisation should be treated with considerable caution. The ministry said there would be more live-fire drills in the South this month, involving Taurus air-to-surface missiles mounted on F-15 jets. Monday’s drills simulated the targeting of the Punggye-ri nuclear site in Kilju County, where North Korea carried out its bomb test. South Korea and the US had also agreed “in principle” to revise current guidelines so that the South could double the maximum payload of its ballistic missiles, the Yonhap news agency also reported. How did the nuclear test unfold? On Sunday, seismologists started picking up readings of an earth tremor in the area where North Korea had conducted nuclear tests before. The US Geological Survey put the tremor at 6.3 magnitude. North Korea later confirmed its sixth and most powerful nuclear test. Pyongyang then released pictures of leader Kim Jong-un with what state media said was a new type of hydrogen bomb. Officials in China said they were carrying out emergency radiation testing along the border with North Korea. The nuclear test prompted an angry response from US President Donald Trump who denounced it as “hostile” and “dangerous”, and called the North a “rogue nation”. He added that the US was considering stopping all trade with any country doing business with North Korea, which relies on China for about 90% of its foreign trade. US Defence Secretary James Mattis later told reporters that while the US would respond to any threat “with a massive military response, a response both effective and overwhelming”, it was “not looking to the total annihilation of a country, namely North Korea”. A White House statement also said that Washington would defend itself and its allies “using the full range of diplomatic, conventional, and nuclear capabilities at our disposal”. South Korean President Moon Jae-in called the test an “absurd strategic mistake” and urged for the “strongest possible” response, including new UN Security Council sanctions to “completely isolate” the country. China said on Monday that it had lodged a diplomatic protest with North Korea over the test. Both China and Russia said any solution to the crisis could only come through talks. Estimations of the power of the tested device have varied widely, from 50 kilotons to 120 kilotons. A 50kt device would be about three times the size of the bomb that struck Hiroshima in 1945. Hydrogen bombs are many times more powerful than an atomic bomb. They use fusion – the merging of atoms – to unleash huge amounts of energy, whereas atomic bombs use nuclear fission, or the splitting of atoms.